Purple drank for a purpose. Through the end of August sip a Lavender & Thyme Mojito at any LEAD Hospitality Group restaurant (McCray’s, The Mill Kitchen + Bar, Foxtrot). With 100 percent of proceeds from the $8 cocktail benefiting The Epilepsy Foundation of GA, what more of purpose do you need? Last year, LEAD raised a whopping $20,000 to improve the quality of live of those living with epilepsy by accelerating therapies, finding cures, and saving lives. Pastry chef Jasmin Willis (Ford Fry restaurants) is opening a coffee shop style bakery in Roswell (1164 Canton St.) this week. Look for pastries, eggs, toast, and charcuterie boards on the menu at Gracious Plenty Bakery & Breakfast, and eventually mimosas when a liquor license is acquired. Will they call it Chick-fil-Eh? Atlanta-based Chick-fil-A announced plans to expand internationally to Toronto, with many more Canadian stores on the horizon in the next five years. Midtown’s Babalu has expansion plans for Historic Roswell. Latin-inspired tapas and cocktails will be served from the Roswell Theater in early 2019, which dates back to 1938. On the rocks, with or without salt, but never with sour mix, Guac Y Margys opens this Friday (7/27) along the Beltline in the second phase of Studioplex (661 Auburn Ave.) The taqueria menu chock full of chips, salsa, queso, and guacamole accompanies margaritas made with fresh juices and six local beers on rotation. There is some sweet merriment to mark in your calendar. On July 27, Krispy Kreme celebrates 81 years with the gift of a dozen glazed doughnuts for $1 (with purchase of one dozen doughnuts). They will also have a glazed confetti doughnut, available for limited time, that will make your Instagram pretty. Chef Hector Santiago’s second location of El Super Pan is now open at The Battery Atlanta, serving Latin American fare and craft cocktails for breakfast, lunch, and dinner. Don’t miss the chipotle chocolate chip cookies. Let’s taco bout those rosy pink hibiscus corn tortillas from Texas based Velvet Taco. They are moving into the Buckhead Market Place on West Paces Ferry road next year. Pop-up alert. Chef Todd Ginsberg (The General Muir, Yalla, Fred’s) will give a taste of forthcoming Wood’s Chapel BBQ at Superica (Krog St. Market location) on August 2 from 9 p.m. until it’s gone. He’ll be serving whole hog barbecue, tacos topped with red chile spritz and the choice of peach or serrano pepper salsa for $2 a pop. With 14 locations in Georgia, J.R. Crickets expands their lemon pepper wetness into new territory. The College Park location (3529 Main St.) is now open. After a short hiatus, the Sandy Springs location of Henri’s Bakery & Café is back open with a new look. They are kicking off the new digs and a new school year with a back to school party this Saturday. From 10:30 a.m. -1:30 p.m. kids of all ages can enjoy samples, face painting, and balloon art. Taste of Atlanta rings in 17 years with a return to Historic Fourth Ward Park for a 3-day food and drink festival from Oct. 19-21. Tickets are now on sale for a taste of more than 90 restaurants across the city. 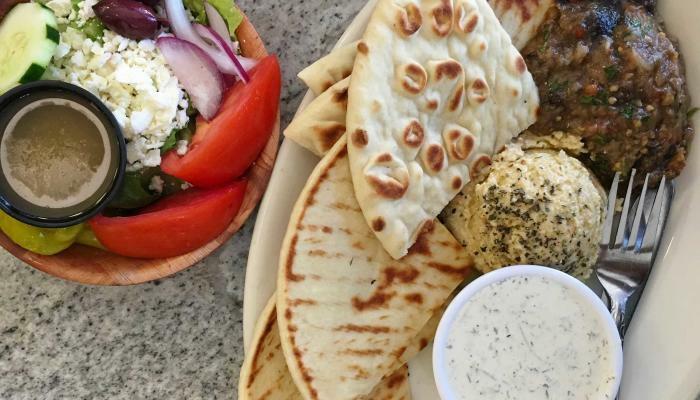 College Park Greek restaurant Kafenio is bringing a taste of the Mediterranean to Avondale Estates. Serving breakfast, lunch, dinner, and craft cocktails, Kafenio will open early 2019 in the Willis Apartment complex at 2700 E. College Ave.
Want to build your cocktail knowledge, learn how to shake and stir craft cocktails, and watch bartenders compete in drink competitions, or sample spirits? The Athens Cocktail Classic, a weekend of events with bar heroes like Jerry and Krista Slater (The Expat), Greg Best (Ticonderoga Club), Miles Macquarrie (Kimball House), and Chad Ralston (ASW Distillery) will be held August 16-18 in…well, Athens. Savi Provisions in Buckhead is having a grand opening party and you are invited. The new Buckhead location (308 Pharr Road) has an all-ages day planned on Saturday from 2-6 p.m. with tastings, samples, and giveaways. The free event gives guests the chance to be the first to experience Rise and Revelry rooftop bar and restaurant.